Saigon fell to the Viet Cong on April 30, 1975. That was the day Tuyet Le and her family left Vietnam. She was 3 years old when they came to America as refugees. 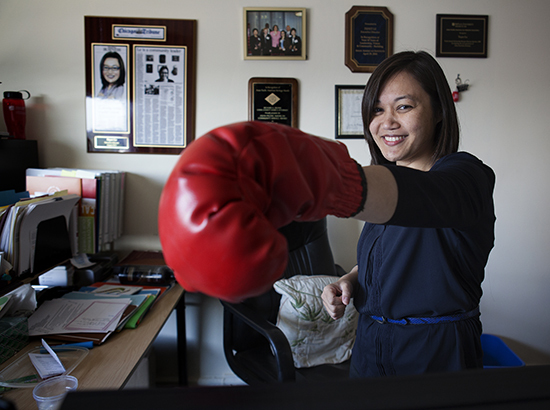 Le, 42, now works to help other immigrants and Asian Americans as the executive director of Asian Americans Advancing Justice – Chicago. She also serves on the board of directors of the Illinois Coalition for Immigrant and Refugee Rights and the Asian American Justice Center. Asian Americans Advancing Justice advocates for civil and human rights issues with an Asian American lens. It also trains young people how to organize and research advocacy campaigns. Asians are 6.9 percent of the population in Cook County. The Chicago Reporter sat down with Le to discuss immigration, political participation and other issues that affect Asian Americans. How has your experience as a refugee and immigrant impacted your work today? I think my experience as a refugee is why I do what I do. I grew up in Wisconsin, where there are not many refugees. What I did know about Asians were their stereotypes as a model minority. It did not fit in with what was around me. I think in college was the first time I saw Asian Americans articulate what that identity could be. Milwaukee is a very segregated town. Teachers would do the census with a tally on the board, how many whites, how many blacks and other. That was me. The search for an identity being other than “other” was very important. What issues do Asian Americans face now? We work on immigration, so integration, as well as the immigrant’s ability to come here. One of the biggest things that affect Asians is the sibling category. I don’t think enough Asians are aware of this. A lot of people use family visas and sibling visas to come to the U.S.
What about Asian Americans in Chicago? Other issues we work on are voting rights. We had a huge census campaign, which affects the way redistricting is done. It also affects which communities have language access in voting. The Chinese were given assistance in Cook County voting. After 2010, Indians were also given access. For state issues, we are working on a language access law. There really needs to be an increase in Asians registered [to vote]. We’re trying to do voter registration. The bigger thing we work on with the coalition is midterms. I think Asian Americans can really make a difference in what happens with the state. There was a video released to several news stations in which a Chicago police officer hit an Asian-American woman who was kneeling and screaming. He was threatening to put her in a mailbox, saying she wasn’t legal. She was actually a citizen. It’s unclear how the city is handling this. We worked with a lot of Asian-American organizations to have a town hall last June. The police officers are still being investigated. One of the things we asked at the town hall was prohibition of threatening deportation. Some other issues that came out were how do people have better access working with the police. We pushed a language access ordinance on the city as well. How do Asian stereotypes work against the Asian-American community? I think the so-called good ones, like being educated and well-off, really hide the more marginalized sectors. If that set of stereotypes informs public policy, then agencies don’t get the resources they need to serve folks. … I’ve heard about meetings in Springfield where they say, let’s cut [funding to] Asian-American organizations. Other stereotypes are being a perpetual foreigner. The woman in the video I was talking about earlier, she is a citizen, yet she is being threatened with deportation with the assumption that she is foreign and does not belong. I also think there are stereotypes about being quiet or being technician types that hinder Asians in business. They are not seen as management material. Why are Asian Americans often underrepresented in politics? For Illinois, the Asian-American community is a growing community, but still very small. I do see second or third-generation people increasingly running for office. There are a lot of cultural things about how families feel about running for politics. They often come from places where the government is not a democracy, and the government cannot be trusted. In terms of why they do or do not win, redistributing is fractured. Chinatown was in four districts. What kind of representation do they have when they are split across four districts? The General Assembly has no Asian Americans, and it didn’t seem like we were going to get elected. We asked several legislators to form a caucus, and we meet quarterly with them. What is being and should be done to empower the political voice of Asian Americans? What we do is actually try to look at specific issues that really affect everyone and ask, is there an Asian-American lens to it? We create a sense of shared fate. The more we do things together, the better our voices are being heard. And especially before the 2012 elections, you never see numbers reported on Asian-American voting. In 2012, they started reporting Asian-American numbers. Whether there’s an Asian-American angle on the issue, being able to translate that information will capture their attention if they can communicate that issue. For the 2014 election, we’re still doing some planning. We want to do joint campaigns to get Asian-American voters out. This article has been edited and condensed for clarity. The Rauner-endorsed redistricting scheme would minimize the involvement of legislators – and minorities – from the process of drawing legislative boundaries in Illinois.